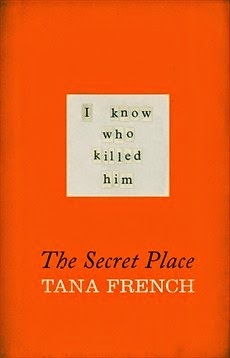 Imagine Curtis Sittenfeld's Prep mixed with a pinch of Sherlock, a dash of Midsomer Murders and a subtle hint of The Craft, and you have something approaching Tana French's utterly compelling and slightly chilling The Secret Place. A year after teenager Chris Harper is found murdered close to a private girls' school in Dublin, student Holly Mackey goes to see Detective Stephen Moran and hands him a picture she has found of Chris, tacked on a school noticeboard called the Secret Place. Under the picture of Chris are glued, like a ransom note, the words "I know who killed him". And so begins the most intense day of Stephen's life, as he and a fellow detective head to Holly's school to try to find a murderer. The Secret Place is split into two, with chapters alternating between the present day and the past, the latter starting roughly nine months before Chris was murdered and taking us to just after his killing. While we know Chris will die - French makes sure to tell us the exact number of months, weeks and days to his death in each chapter set in the past - what we don't know is how and who is involved, so there's a sense of doom that pervades the past narrative. And in the present, we know that Stephen is drawing ever closer to finding a murderer, so the tension is clear in every chapter. French's characters are well-formed, and fascinating. Stephen is a clever, determined guy, who knows that helping to solve this murder could get him out of the cold cases squad and into the department he really wants to be in. That's slightly calculating, but his ambition makes him more likeable (for me at least), and his ability to mould his personality and mannerisms to suit the person he is talking to is interesting to watch. He's a people person, and his intuition and ability to read others makes him key to solving this case. Unfortunately for Stephen, he's stuck working with Antoinette Conway, the lead detective in the Chris Harper case. She's a tough, no-nonsense detective (sort of like Keeley Hawes' Lindsay Denton in Line of Duty) who doesn't fit in with the rest of the murder squad, and who doesn't care that everyone hates her. She's professional, super clever, and frustrated that she hasn't yet found Chris's killer. Watching her develop and form a partnership with Stephen over the course of the novel is great - you just know this is a pairing that could go far if they just stopped underestimating each other. But the most compelling characters are the teenage girls at the centre of the novel - Holly and her three friends Julia, Becca and Selena, and their rival gang Joanne, Gemma, Orla and Alison. The interactions between these girls - friends, enemies, frenemies - is a bit like reading an account someone has written of watching different species of monkeys living together in the same enclosure. French captures being a teenage girl perfectly - the bitchiness, the insecurity, the rivalries, the distinct yet same personalities. But most of all, French shows an exaggerated version of how teenage girls can feel invincible if they just have a group of friends surrounding them. The Secret Place is a murder mystery, a psychological thriller and an examination of growing up all in one. It's pacy (even though it's more than 500 pages long), and it's a real page-turner. This is definitely the book that will break French out, and have everyone talking. •The Secret Place is released in the UK on August 28. I've found Tana French a bit patchy so far (have read all of her novels) in both plot and narrative; but when she's good, she's very good. The latest sounds intriguing: many thanks for the heads-up! If you haven't read it, I do recommend 'Faithful Place'. IMO it is her best - and will tell you a lot more about Stephen. I've been told The Secret Place will be the book to take her to new heights, and I certainly thought it was brilliant. Thanks for the rec, I'll add Faithful Place to my list.